Rick Suttle has been writing professionally since 2009, covering health and business for various online and print publications. He has worked in corporate marketing research and as a copywriter. Suttle holds a Bachelor of Science in marketing from Miami University and a Master of Business Administration from California Coast University. He is author of the novels "Hell Year" and "Suicide Peak." Swelling and red rashes on the skin are no fun, and it could be a bacterial infection called cellulitis, according to PubMed Health. You may also experience a warmth on the skin, sensitivity to touch and fever. While there are a number of natural remedies for cellulitis, coconut oil is said to be highly effective in treating the condition. Coconut oil has certain bacteria-fighting properties that help eliminate the condition. There are also other things you can do along with coconut oil to expedite the healing process. Cellulitis is usually caused by one of two common types of bacteria: streptococcus and staphylococcus, according to PubMed Health. One form of bacteria caused by cellulitis is staphylococcus aureus, which is increasingly becoming more antibiotic-resistant. The antibiotics can actually exacerbate the condition, which may make coconut oil a more desirable treatment. The 2013 issue of "BioMed Research International" reports that coconut oil shows strong antibacterial activity against staphylococcus aureus. The most common location for cellulitis is on the lower leg. This condition can develop when you have a disrupted condition on your skin, including scrapes and cuts. The bacteria then infect the region, causing cellulitis. If you are obese, eat poorly and fail to exercise regularly you may also be prone to this condition. Certain hormonal conditions can also cause outbreaks. Coconut oil contains lauric acid, a saturated fat with healing properties. Your body converts lauric acid into monolaurin or glycerol monolaurate, which then helps fight different types of bacteria and viruses. Coconut oil also contains capric and caprylic acid which, along with lauric acid, are known for fighting many types of human ailments: herpes, influenza and HIV or human immunodeficiency virus, which causes AIDS, according to Organic Facts. 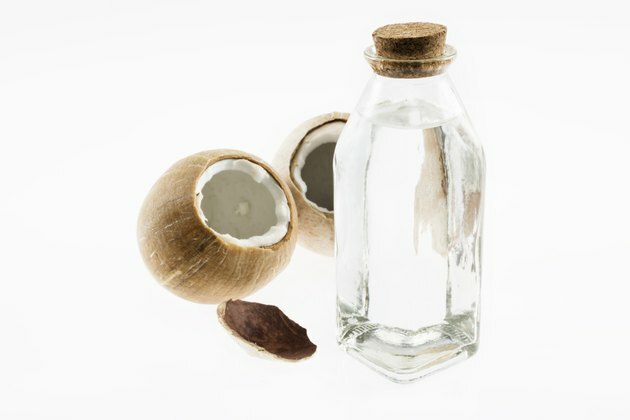 The best form of coconut oil for treating cellulitis is virgin coconut oil. The saturated fats contained in virgin coconut oil make it an ideal soothing aid for the small blisters and swelling caused by cellulitis. Find a licensed message therapist to administer treatments if you have cellulitis in a place that's hard to reach like the back. They know how to apply the oil so it better seeps into the folds of your skin and pores. The University of Maryland Medical Center recommends that you avoid massage if you have an active infection, otherwise a lymph drainage massage may help prevent future eruptions. Cellulitis can lead to further complications such as deformities, heart problems, fatigue, nervousness, depression, nerve pain and insomnia. Therefore, it is always best to see your doctor before commencing any treatments. Ask your doctor which diet is best for your condition. Fresh fruits and vegetables are often recommended for cellulitis, as they contain enzymes for fighting infection. You should also drink plenty of water and get lots of exercise. Moreover, exfoliate your skin with a soft brush after bathing. This helps promote blood flow, which sends nutrients to the infected areas.